Breakfast at Tiffany's is part of a compilation that is described as a short novel and three stories. The novella is the story of the now famous characters of Holly Golightly and Fred. The written version is slightly sadder than the popular movie, the story is reputed to be based on the breezy life of Carol Matthau -- wife of actor Walter Matthau. Running away from all that she was, Holly is a creature of her own imagination. Surrounded by a fast crowd and Latin lovers, her day begins at 3 pm and she wears a Manhattan ready wardrobe of black on black. She is drifting through life fighting the mean reds (a harsher form of the blues) and taking refuge in the finer things. Fred, the story's narrator, is a free-lance writer who encounters Holly in the building where they are neighbors. Like any well-written short story, it has a surprising density given its length. The dialogue is quick and the characters deftly drawn. Ever popular, the story has made it to Broadway. Previews begin March 4 and the show premieres March 20 at the Cort Theatre in New York. The show stars British actress Emilia Clarke, star of HBO's adaptation of George R. R. Martin's Game of Thrones. The other stories in the collection are "House of Flowers," about the love and life of a Port-au-Prince lady of the evening; "A Diamond Guitar," a tale set in a prison; and "A Christmas Memory," about the friendship between a child and a child-like woman. In some form, the stories were originally published in Esquire, Mademoiselle and Harper's Bazaar. Truman Capote began his career as a copy boy for The New Yorker, where he was fired for accidentally offending Robert Frost. His work includes Other Voices, Other Rooms, and The Grass Harp. He wrote the screenplay for John Huston's film, "Beat the Devil." His most acclaimed novel was In Cold Blood. Truman Capote died shortly before his 60th birthday in 1984. If on a winter's night a traveler is like a spider web, intricately woven together with very fine strands. The journey is like traveling to a foreign city, where you often get lost, but that's part of the fun. If on a winter's night a traveler is the story of one reader who finds that the novel he is in the midst of reading has gotten mixed up in the printing process. The second chapter in the reader's book is actually part of another book. His pursuit of the original novel leads him on a bizarre chase that is amusing in its melodrama. As Calvino gives his readers a peak into the main character's search,he also imparts the initial chapters of the many novels the reader encounters. (It does get a bit confusing). Each new story chapter is filled with vastly different locales and scenarios that are remarkably imaginative. This work captured the former English teacher Sting, who named his 2009 album "If On a Winter's Night" in tribute to Calvino. Calvino is an Italian writer and the novel has been translated from his native tongue. 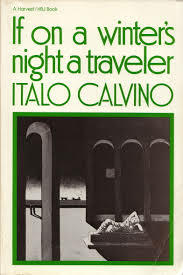 Italo Calvino was an editor with the Italian firm Giulio Einaudi Editore. His other works include Invisible Cities and The Castle of Crossed Destinies. He died in 1985. His works continue to be among the most translated works in literature. Originally published in November/December 1994, Volume 1, Issue 6 of The Literary Cafe. It's 1896 in New York City, and newly appointed police commissioner Theodore Roosevelt (the very same) has a murder on his hands. It is a murder that even by New York standards has stunned the police department, the horrible mutilation of a boy prostitute. Roosevelt puts his job and credibility on the line by secretly handing the case over to two of his former college classmates from Harvard: John Schuyler Moore, now a crime reporter for The New York Times, and Dr. Laszlo Kreizler, a noted psychologist or "alienist." Aiding these two gentleman is Sara Howard, a secretary in the police department. These three, along with various former patients of Dr. Kreizler, must toil in secrecy because the emerging discipline of psychology is viewed by the public with skepticism at best; public sympathy for the victim is questionable as well. Despite this, Roosevelt and his allies are committed to righting this wrong. Their goal is to create a psychological profile of the murderer, likely a serial killer, before he strikes again. The book is wonderfully written and works extremely well on a couple of levels. First, it is a taut psychological thriller; you immediately become caught up in the action. Secondly, it's a great historical novel, giving readers a hauntingly real feel for New York City in 1896. Carr paints an historic picture of Gotham as a city of tenements and mansions, corrupt cops and flamboyant gangsters--a place, perhaps, not so different even today. Caleb Carr was born in Manhattan. He is a novelist and military historian. A misanthrope, he lives in upstate New York. His father was Beat generation and UPI reporter Lucien Carr. Carr's most recent novel is The Legend of Broken. Contributed by Nina Holcomb - Chicago. Originally published in November/December 1994, Volume 1, Issue 6 of The Literary Cafe. "In Mongolia, when a dog dies, he is buried high in the hills so people cannot walk on his grave. The dog's masters whispers into the dog's ear his wishes that the dog will return as a man in his next life. Then his tail is cut off and put beneath his head, and a piece of meat or fat is placed in his mouth to sustain his soul on its journey; before he is reincarnated, the dog's soul is freed to travel the land, to run across the high desert plains for as long as it would like. I learned that from a program on the National Geographic channel, so I believe it is true. Not all dog return as men, they say; only those who are ready. I am ready." says narrator in Garth Stein's novel. That narrator, as you may now have gathered, is a dog named Enzo. This is a book that will warm your heart, and at times break it, regardless of whether or not you have a dog. Other books have left you wondering what animals are really thinking about us, but few tackle their soul so poignantly. Told through the knowing eyes of Enzo, the beloved dog of Denny Swift. Enzo is wise, caring and funny. Enzo takes care of his family, especially his owner, when all seems lost. The story reminds you of the unconditional love of a dog and may leave you talking to your pet more. 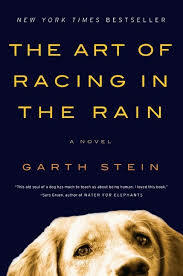 Garth Stein's The Art of Racing in the Rain is published in 30 languages, and was the #1 BookSense selection for June, 2008, the Starbucks spring/summer 2008 book selection. The Art of Racing the Rain has been on the IndieBound bestseller list since its publication.